Every square foot in your home has considerable value. New home construction ranges from $65 a square foot to over $500. 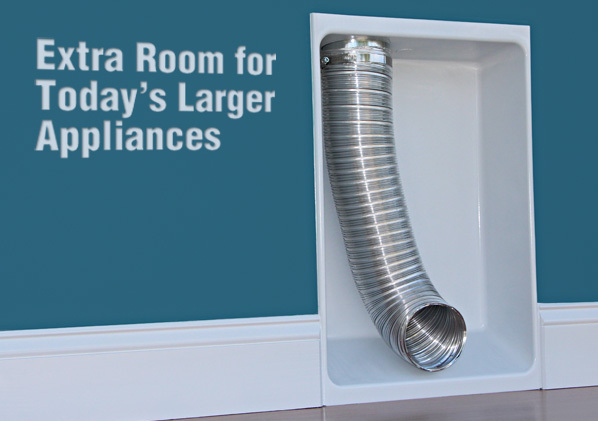 In the past, the metal 4" exhaust pipe came right through the drywall or plaster wall and provided enough penetration to connect the flex transition hose between the dryer appliance and the exhaust pipe. This connection hose usually lies on the floor requiring two tight bends to compensate for the locations of these two ports. At a minimum, these bends require about 5" of space between the appliance and the wall. When measured, a typical 27" wide dryer along with a matching washer held out just over 5" encompasses more than two square feet of living area. At this point the Dryerbox paid for itself 12 times over. For architects, layout of walls, closets and doorframes is very critical. Many times the designer forgets to provide a full 5" of space behind the dryer and the result is a door that won't shut or an appliance that ends up in the hallway. The Dryerbox provides a valuable specification for the construction plans. For builders, the Dryerbox® virtually eliminates callbacks due to clothes dryers not working properly. Safely recessing the transition hose in the wall makes the laundry room look and feel larger.